Windshield Mount for Action Cameras by Rostra! At Rostra, we are pleased to announce the availability of an innovative new product that will change the way you use an action camera in your vehicle. 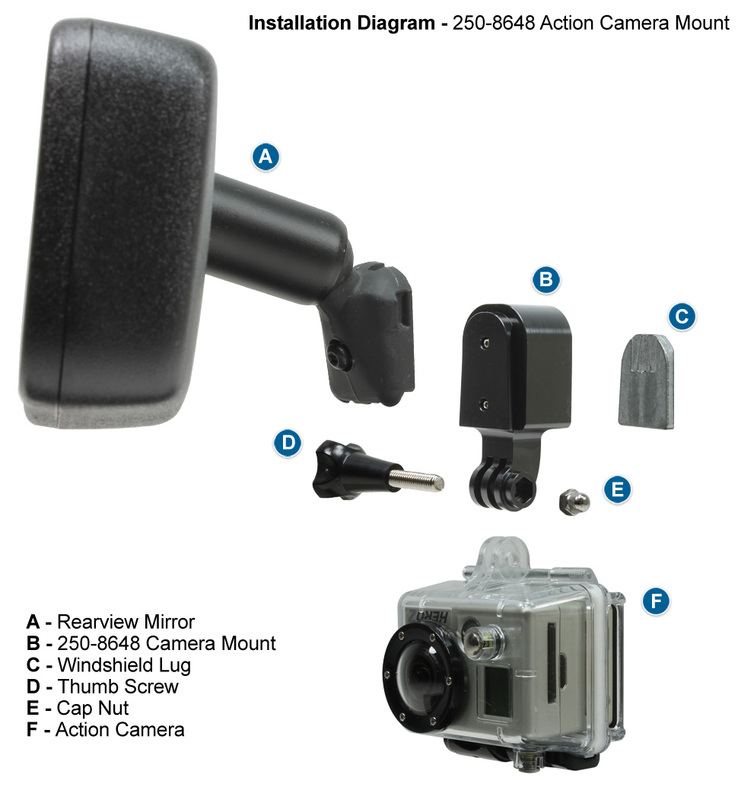 Available for immediate shipment, part number 250-8648 is an adapter that allows drivers to take advantage of the factory rearview mirror mounting point in most vehicles in order to mount their action camera. 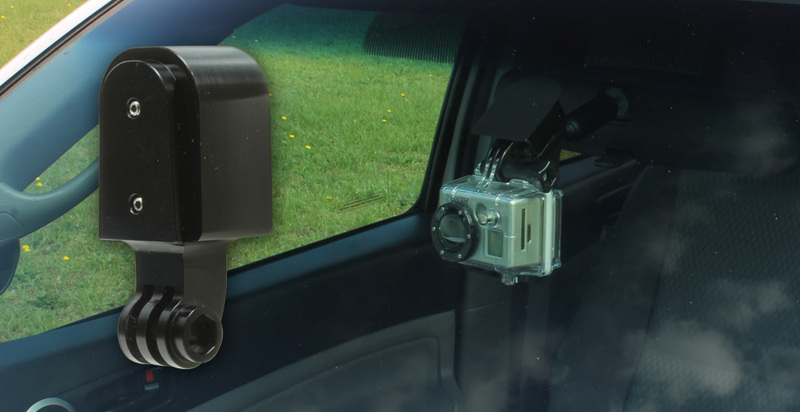 This adapter installs between the rearview mirror and windshield glass and provides a permanent, solid mounting location for action cameras sold by GoPro and other manufacturers. This mount is the ideal solution for filming when off-road, on a racetrack, or while driving on the highway. Designed for use with the majority of action cameras on the market today, our 250-8648 mount includes the following features. Easily attaches to D-shaped windshield lugs. Constructed from lightweight machined aluminum. Black coating blends seamlessly with interior. Works with all two-hole action camera housings. Two set screws hold tightly to windshield lug. Fits discretely behind rearview mirror. Provides perfectly centered location for video. Uses the thumb screw and cap nut supplied with your camera. Will This Work With My Action Camera? The 250-8648 mount allows for the attachment of action camera housings that incorporate a universal two-hole and thumb screw design. This base simply slides between the feet of the mount and affixes the camera in place using the thumb screw and cap nut provided with the action camera from the manufacturer. For the best in driving experience, choose an action camera mount from Rostra, the leader in vehicle comfort, safety, and convenience. Please note, action camera windshield mounts are only sold through authorized distributors. 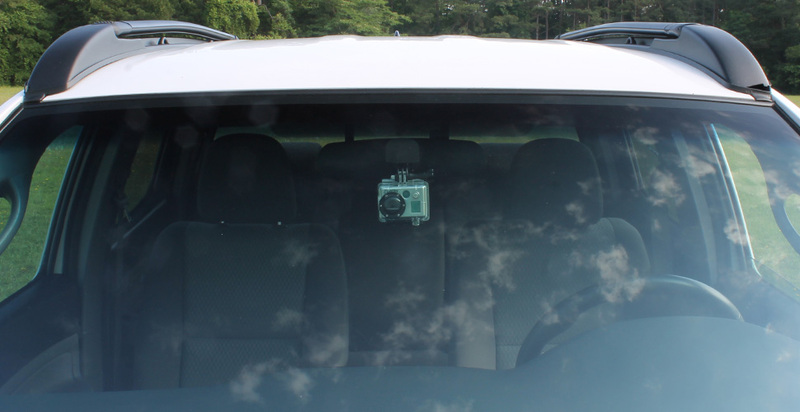 Please contact Rostra to locate a distributor in your area for your GoPro windshield mount.